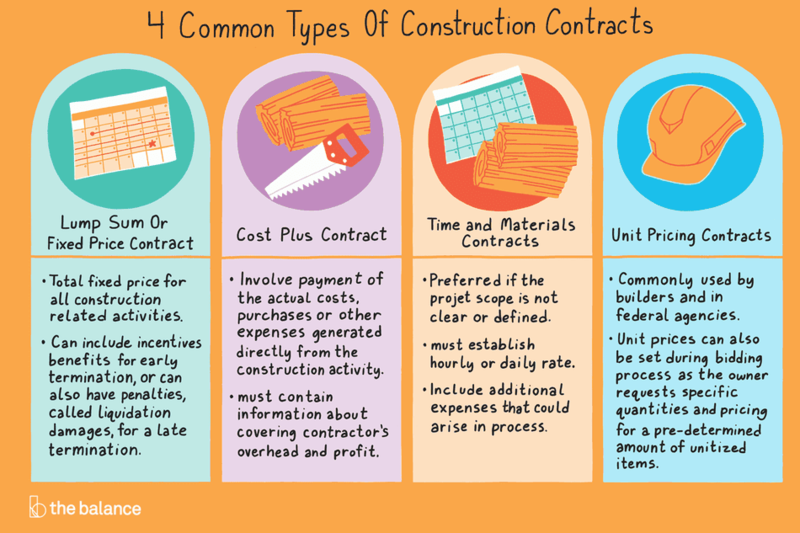 Construction contract types are usually defined by the way, the disbursement is going to be made and details other specific terms, like duration, quality, specifications, and several other items. These major contract types can have many variations and can be customized to meet the specific needs of the product or the project. This type of contract involves a total fixed priced for all construction-related activities. Lump sum contracts can include incentives or benefits for early termination, or can also have penalties, called liquidated damages, for a late termination. Lump Sum contracts are preferred when a clear scope and a defined schedule has been reviewed and agreed upon. This contract shall be used when the risk needs to be transferred to the builder and the owner wants to avoid change orders for unspecified work. However, a contractor must also include some percentage cost associated with carrying that risk. These costs will be hidden in the fixed price. On a lump sum contract, it is harder to get credit back for work not completed, so consider that when analyzing your options. Cost plus contracts are used when the scope has not been clearly defined and it is the owner responsibility to establish some limits on how much the contractor will be billing. When some of the aforementioned options are used, those incentives will serve to protect the owner's interest and avoid being charged for unnecessary changes. Be aware that cost-plus contracts are difficult or harder to track and more supervision will be needed, normally do not put a lot of risk in the contractor. Time and material contracts are usually preferred if the project scope is not clear, or has not been defined. The owner and the contractor must establish an agreed hourly or daily rate, including additional expenses that could arise in the construction process. The costs must be classified as direct, indirect, markup, and overhead and should be included in the contract. Sometimes the owner might want to establish a cap or specific project duration to the contractor that must be met, in order to have the owner’s risk minimized. These contracts are useful for small scopes or when you can make a realistic guess on how long it will take to complete the scope. Unit pricing contracts is probably another type of contract commonly used by builders and in federal agencies. Unit prices can also be set during the bidding process as the owner requests specific quantities and pricing for a pre-determined amount of unitized items. By providing unit prices, the owner can easily verify that he's being charged with un-inflated prices for goods or services being acquired. Unit price can easily be adjusted up and/or down during scope changes, making it easier for the owner and the builder to reach into agreements during change orders.